Resa Robinson, a sassy reporter and fantasy blogger, showed up at my office for an interview one day, looking for the real story behind the mysterious CEO of Cobalt Computers. Well, she found it when she caught me shifting on the roof of my building. With no other option but to take her as prisoner, I now have to decide what to do with this bold, beautiful woman who is more intrigued than intimidated by my status as a dragon. The longer I hold her captive, however, the more my attraction to her grows by the second. My need to possess every inch of her is becoming unbearable, and I can’t help but surrender to the passion that threatens to consume me. Surely, someone will come looking for her soon, but freeing her could spell the end of everything I’ve ever known and spent my life protecting. Will I be able to convince this feisty beauty to stay with me and keep our little secret? ***This is the third installment of the Dragons Of The Darkblood Secret Society series. Each story is a standalone and may be read in any order. 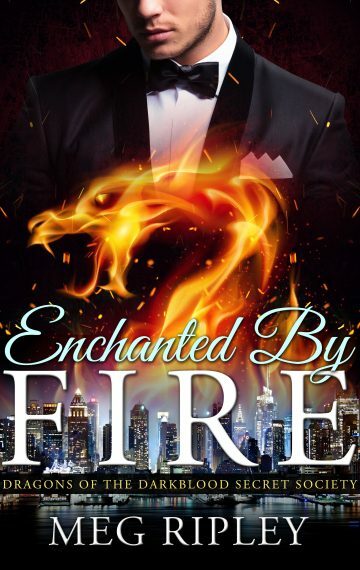 Enchanted By Fire is a 33,000 word novella with steamy shifter scenes intended for readers 18+. The Kindle edition features additional bonuses for your reading pleasure.